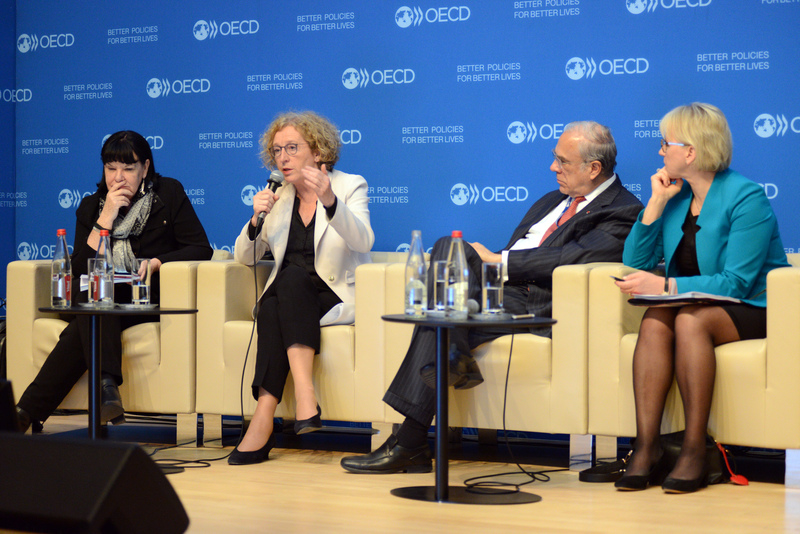 On May 18, the Global Deal Flagship Report “Building Trust in a Changing World of Work” was launched at a well-attended event at the OECD in Paris. Speakers represented governments, trade unions, businesses and international organisations, and highlighted the importance of social dialogue in creating decent work and inclusive growth and emphasised the Flagship report as a true milestone for the Global Deal partnership. The Swedish Foreign Minister, H.E. Margot Wallström, opened the event by speaking about the opportunities and challenges in the global labour market and the background and aim of the Global Deal partnership. The minister emphasised that the report shows the important role for social dialogue and sound industrial relations to deal with current and future challenges on the labour market. Furthermore, the minister highlighted that an important part of the report is to illustrate commitments and good practices made by partners. Angel Gurría, Secretary-General at the OECD, emphasized the need for a new approach, and that the Global Deal with a focus on social dialogue is important to address the downside of globalisation and the increasing inequalities. Secretary-General Gurría mentioned that the report finds that good labour relations are a way to reduce inequalities in jobs and wages and better share prosperity. Moussa Oumarou, Deputy Director-General for Field Operations & Partnerships at the ILO, spoke about the importance of social dialogue to achieve the ambitious goals in the 2030 Agenda. H.E. Muriel Pénicaud, the French Labour Minister, spoke about the French engagement in the Global Deal. 16 French companies and four trade unions have joined the partnership so far. According to Pénicaud, the idea of the Global Deal resonates well with the French social partners because they realize the need to combat inequality and to focus more on the social dimension in globalization. – Are we able or not to have an inclusive growth approach in our world? To do so I think all partners must recognize that social dialogue is a powerful tool. Let’s make the Global Deal the greatest deal, said Muriel Pénicaud. Other speakers included Sharan Burrow, General Secretary of the International Trade Union Confederarion (ITUC) and Senior Advisor to the Global Deal, who shared the trade union perspective of the flagship report, and Facundo Etchebehere, Global Public Affairs Director and Head of Corporate Affairs for Essential Dairy and Plant Based at Danone, who gave the business perspective on a well-functioning social dialogue. – There is a business case for social dialogue and that is very important to acknowledge. Social dialogue is an enabler of inclusive growth, said Facundo Etchebehere. The report, co-written by the OECD and the ILO, is the first Flagship Report for the Global Deal partnership. The report provides an international portrait of the foundations, trends and challenges connected to social dialogue and sound industrial relations. It aims to demonstrate the potential effects of social dialogue and highlights the Global Deal partnership as a vehicle for accelerating change and as a tool for delivering on the SDGs.